Thanksgiving is more focused on food than almost any other holiday. From the perfectly cooked turkey and the homemade mashed potatoes to the pumpkin pie and delicious treats, Thanksgiving is a chance for families around the U.S. to come together over the dining room table. However, if you're tasked with hosting or preparing Thanksgiving dinner, this can feel like a tall order to fill. Luckily, there are a few kitchen appliances that can make cooking Thanksgiving dinner just a little bit easier. The most important part of many Thanksgiving dinners is the turkey. Preparing a large bird can be both the most exciting and challenging aspect for many hosts. Not only do you have to roast the turkey for hours, monopolizing the use of your oven, but in order to keep it moist, you need to open the oven door and baste the turkey while it cooks. A roaster oven with a self-basting lid can help solve this problem. Rather than hogging your range all day, which can leave casseroles and other side dishes cold on the counter, the turkey can be cooked completely in a roaster oven. This frees up the oven and your schedule for the other important traditional Thanksgiving dishes. Fit your turkey into this countertop appliance, just as you would in a basting pan. Set the temperature to your preference. It will cook 30 percent faster and use 36 percent less energy than a traditional oven. 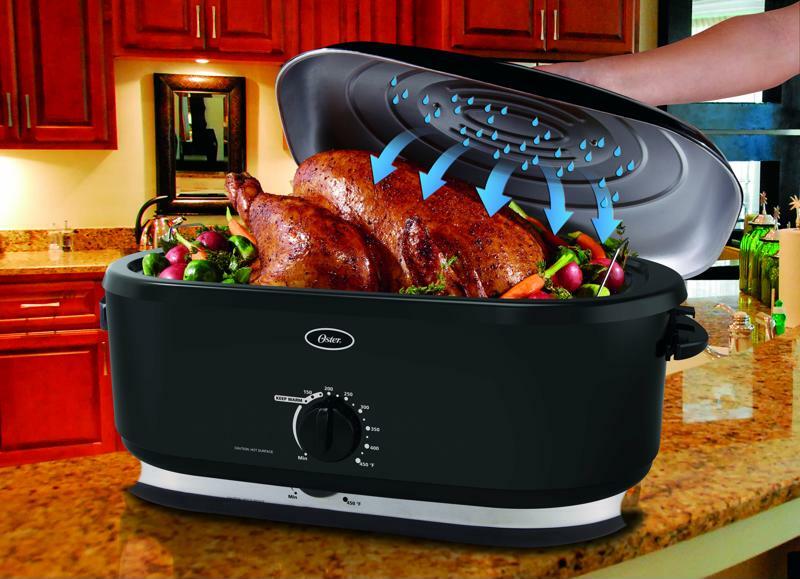 In addition to being more efficient, the roaster oven will also baste the turkey for you. The moisture that builds up during the cooking process gathers inside the lid to be dispersed automatically, keeping your turkey moist. You may use your blender more for smoothies and homemade sauces, but this handy kitchen appliance can actually help when it comes to Thanksgiving too. Use your performance blender to make lump-free mashed potatoes, gravy, cranberry sauce or even pumpkin pie filling! A blender can help save you time by effortlessly smoothing any classic Thanksgiving food to the perfect consistency. Whether you're chopping carrots or carving the turkey, you don't want to wait until it's Thanksgiving to realize you need better knives. A reliable knife or set of knives can make a world of difference in how hard you have to work to get that ideal cut. From cooking the turkey to remembering the pie is in the oven during dinner, kitchen timers are critical for Thanksgiving because there are so many things going on. They can give you a quick and friendly reminder to make sure nothing is undercooked or overdone. The safest way to ensure that your turkey isn't undercooked or overdone is to use an accurate meat thermometer. This small tool can be the key to ending up with meat that's safely prepared and perfectly cooked.